In business, you have your share of sensitive data, whether it’s medical records, client records or even employee information. It’s your responsibility to keep this data secure, and you could be held liable if such information were stolen and used against you. Not to mention you may have sensitive data concerning your products or services that could be used by competitors if it were stolen. With this in mind, not only is securing your data critical but deleting your data is essential too. Few businesses depend solely on physical paper documents these days (keeping physical data has a huge number of drawbacks compared to storing your data electronically), which means you can’t just feed your data through the shredder and be done with it. To get rid of electronic data, you’ll need a data destruction service. First, it’s important to understand what data destruction is. If you no longer have the need for certain data on your hard drives, like old employee records, then you may want to delete it. However, simply highlighting the files and pressing delete will not permanently remove this data. Hackers can still retrieve deleted information using a variety of methods. This is where data destruction comes in. At RAKI Computer, we provide two types of data destruction – DOD data wiping and hardware destruction. 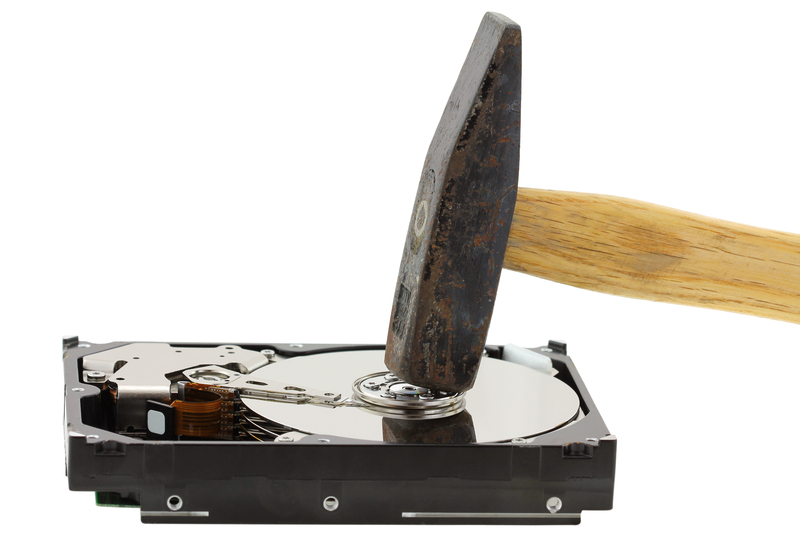 If you want to keep your hard drives or other hardware, and only erase the data on it, you’ll want regular data destruction service. This involves the use of special software that performs three separate wipes of your hard drives, erasing and overwriting the data during the process to ensure that it cannot be retrieved. Shredding – using special equipment, your hard drives can be shredded in the same way as paper, thereby making it impossible to extract any data. This process works particularly well when getting rid of a large number of hard drives at once. Demolition – the physical destruction of the hardware. It’s usually the most cost-effective way in which to eliminate your data. It involves physical destruction of your hard drives without going as far as shredding them. Protect your business – Odds are you have all kinds of valuable information regarding your business, from analytical data regarding your company’s performance to information about product designs. Having this kind of data fall into the wrong hands could be detrimental to your business plans, to say the least. Protect your customers – Most businesses collect a lot of customer information, especially if they sell products online. The last thing you want is for your customer’s personal data to be revealed to outside sources. Their names and credit card information could be used for fraudulent purposes that could not only hurt your customers but severely damage your reputation as well. Protect your employees – It’s your responsibility to protect the information that your employees provide you with, from their names to their social security numbers. Not only could their information be used for identity theft if stolen, but some employees may not want certain information to get out; for example, if they have a criminal history that they reported on their job application. Optimize your space – Destroying old hardware, from computers to hard drives, not only ensures that sensitive data cannot be retrieved, but also helps to clear space in your office. There’s no point in having old hard drives clogging up your shelves if you have no need for them. Remain in regulatory compliance – There are laws that govern how electronic data storage media is disposed of for various industries. Using a data destruction service like RAKI Computer will ensure that your business remains in regulatory compliance in regards to these laws. If you have electronic data or computer hardware in need of disposal, consider data destruction to guarantee no sensitive information can be retrieved. Never assume that simply deleting a file means it’s gone forever. For more information about our data destruction services and facilities, be sure to contact us at RAKI Computer Recycling today.